The premier relaxation programming for healthcare settings, The C.A.R.E. 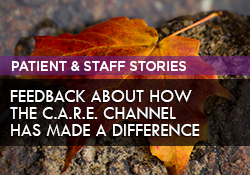 Channel is produced to comfort patients, families, and staff over the full 24-hour cycle. This highly effective therapeutic tool significantly contributes to improved satisfaction and patient outcomes, and helps you create a healing environment for patients, families, and staff. Based on research that connects the use of music and nature to patient outcomes, The C.A.R.E. Channel is appropriate for patients in diverse states of acuity, transcending issues of age, gender, and culture. The 24-hour format includes unique daytime and nighttime imagery to support the circadian rhythm, enhance sleep, and reduce the negative impact of hospital noise. Combining peaceful scenes of nature with beautiful music, The C.A.R.E. Channel is a welcome alternative to commercial television and disturbing sounds. Available in more than 900 healthcare facilities in the U.S. and abroad, The C.A.R.E. Channel brings a healing environment to the patient bedside, waiting areas, and public spaces in acute care hospitals, residential care facilities, hospice/palliative care units, cancer centers, children’s hospitals, and rehabilitation centers. 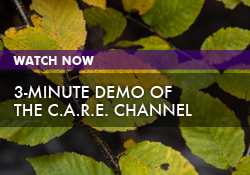 The nature video broadcast on The C.A.R.E. Channel features soothing landscapes, panoramas, and vistas that delight and engage the viewer. The entire channel is produced specifically to be watched by a patient in a bed. We can help you get the hardware required for adding The C.A.R.E. Channel to your existing television system. Check out this infographic to see what sets us apart from other relaxation programming. For a list of studies that show the link between music and nature and patient outcomes, contact us. Discover why The C.A.R.E. Channel is a welcome alternative to commercial television.